A few minutes ago I read about a woman who has 6 children, 35 grandchildren, 75 great-grandchildren and 10 great, great grandchildren — who jumped from an airplane to celebrate her ninety-third birthday. Now that’s a woman who thinks big and believes in the impossible. I believe you can have, do or be anything you can imagine. I love to think big. I also love to read about people who set ‘impossible’ goals and then achieve them. Whether it’s Roger Bannister breaking the four minute mile, NASA sending a man to the moon, Bruce Barton writing a fundraiser letter that pulls a 100% response, or a 93 year — old woman skydiving, all of it proves we have no known limits. None. What we have instead are mind-sets, or mental models. For example, I am currently reading C.K. Prahalad’s book , The Fortune at the Bottom of the Pyramid, and love the true stories of people and companies helping the poor in places like Brazil and India. These people are not thinking small and impossible is not in their vocabulary. For example, Aravind Eye Hospital in India grew from an 11 bed facility to the largest eye care facility in the world. They see over 1.4 million patients and perform over 200,000 sight-restoring surgeries each year. Two-thirds of their patients are served at no cost, and those who pay, pay an average of just $75. The hospital was modelled on the management style of McDonalds — only it gives fast care for low (or no) money. Casas Bahia grew from one man selling blankets and bed linens door-to-door to the largest retail chain in Brazil. They sell electronics, appliances, and furniture. With its emphasis on serving the poorer community, its low prices and credit determined by payment history rather than formal income — 70% of Casas Bahai customers have no formal or consistent income — Casas Bahai grosses over US $1 Billion and has evoked loyalty in its customers. I feel most of us don’t think big enough. Not even close. To help STRETCH your mind, read Prahalad’s book just mentioned and read The Power of Impossible Thinking by Wind and Crook. With all this in mind, what do you want to accomplish in 2018? What’s your impossible dream? What would you want, do, be or have if you knew you could not fail? Whatever it is — write it down — turn it into a challenge — list the steps to ‘overcome/get around ‘the challenge, take action and make it happen. PS. UPYOURS by the way. 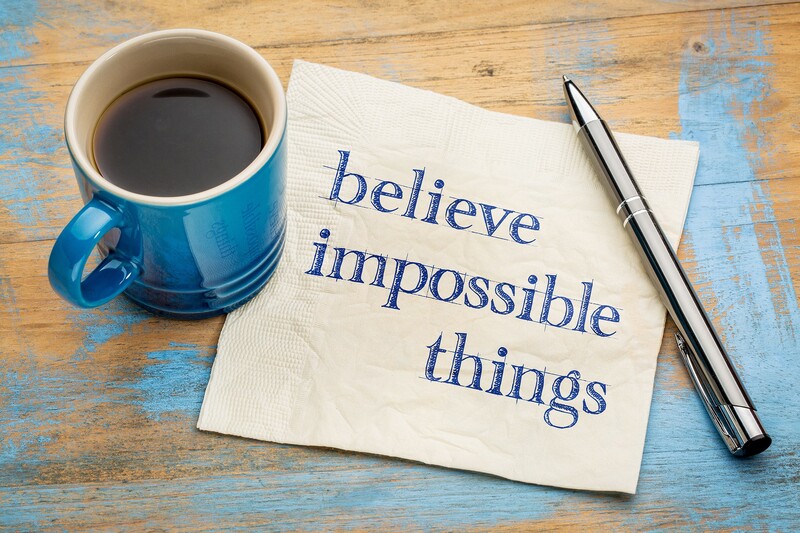 UP your ‘impossibility scale’ and imagine what you can do.